E-Nable designs 3D-printed prostheses for children older than 3 and shares their blueprints so they can be made for as little as $30. This way, the prostheses can be easily replaced as the kids outgrow them. Made from $8 to $15 worth of nontoxic, waterproof 3D-printer plastic and five screws, the prosthetic hands connect to a child’s active muscles via elastic straps. 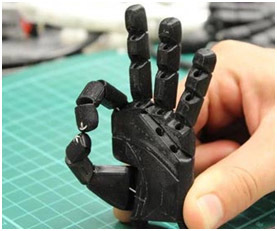 E-Nable has made more than 270 hands and seen other companies use its specs to fulfill thousands of patient's needs. Next: elbows and shoulders. Children were not a viable audience as recently as two or three years ago, because they would outgrow costlier prosthetics too quickly.